Gingivitis – a swelling of the gums – is the preliminary stage of gum disease and the most convenient to treat. The direct reason for gingivitis is plaque – the soft, sticky, colorless film of bacteria that forms constantly on the teeth and gums. If the plaque is not gotten rid of by daily brushing and flossing, it produces toxic substances (toxins) that can irritate the gum tissue, causing gingivitis. At this early stage in gum disease, damage can be reversed, considering that the bone and connective tissue that hold the teeth in location are not yet impacted. Left untreated, nevertheless, gingivitis can become periodontitis and cause long-term damage to your teeth and jaw. Healthy gums are firm and pale pink. If your gums are puffy, dusky red and bleed quickly, you might have gingivitis. Because gingivitis is hardly ever painful, you can have gingivitis without even understanding it. In moderate cases of gingivitis, there may be no discomfort or obvious symptoms. Gums bleed easily when brushing teeth or flossing. Gums are brilliant red or purple. Gums are tender and in some cases painful to the touch. 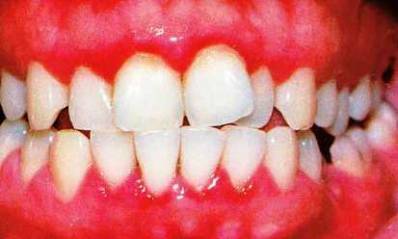 Classic signs and symptoms of gingivitis consist of red, swollen, tender gums that may bleed when you brush. Another early sign of gum disease is gums that have actually receded or pulled away from your teeth, offering your teeth a lengthened appearance. Gum disease can cause pockets to form between the teeth and gums, where plaque and food debris gather. Some individuals may experience repeating bad breath or a bad taste in their mouth, even if the disease is not advanced. How can I Avoid Gingivitis? Good oral health is vital. Professional cleanings are also very essential due to the fact that once plaque has hardened and developed, or become tartar, only a dental practitioner or dental hygienist can eliminate it.